Urolithiasis refers to stones (calculi) in the urinary tract. 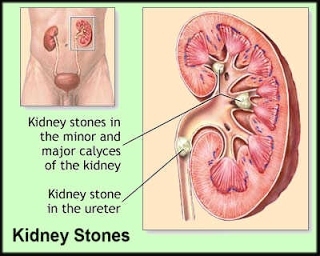 Stones are formed in the urinary tract when the urinary concentration of substances such as calcium oxalate, calcium phosphate, and uric acid increases. Stones vary in size from minute granular deposits to the size of an orange. Factors that favor formation of stones include infection, urinary stasis, and periods of immobility, all of which slow renal drainage and alter calcium metabolism. The problem occurs predominantly in the third to ﬁfth decades and affects men more often than women. Manifestations depend on the presence of obstruction, infection, and edema. Symptoms range from mild to excruciating pain and discomfort. Diagnosis is conﬁrmed by xrays of the kidneys, ureters, and bladder (KUB) or by ultrasonography, IV urography, or retrograde pyelography. Blood chemistries and a 24hour urine test for measurement of calcium, uric acid, creatinine, sodium, pH, and total volume. Chemical analysis is performed to determine stone composition. Basic goals are to eradicate the stone, determine the stone type, prevent nephron destruction, control infection, and relieve any obstruction that may be present. Opioid analgesic agents (to prevent shock and syncope) and nonsteroidal antiinﬂammatory drugs (NSAIDs). Increased ﬂuid intake to assist in stone passage, unless patient is vomiting; patients with renal stones should drink eight to ten 8oz glasses of water daily or have IV ﬂuids prescribed to keep the urine dilute. For calcium stones: reduced dietary protein and sodium intake; liberal ﬂuid intake; medications to acidify urine, such as ammonium chloride and thiazide diuretics if parathormone production is increased. For uric stones: lowpurine and limited protein diet; allopurinol (Zyloprim). For cystine stones: lowprotein diet; alkalinization of urine; increased ﬂuids. For oxalate stones: dilute urine; limited oxalate intake (spinach, strawberries, rhubarb, chocolate, tea, peanuts, and wheat bran). Ureteroscopy: stones fragmented with use of laser, electrohydraulic lithotripsy, or ultrasound and then removed. Chemolysis (stone dissolution): alternative for those who are poor risks for other therapies, refuse other methods, or have easily dissolved stones (struvite). Surgical removal is performed in only 1% to 2% of patients. Assess for pain and discomfort, including severity, location, and radiation of pain. Assess for associated symptoms, including nausea, vomiting, diarrhea, and abdominal distention. Observe for signs of urinary tract infection (chills, fever, frequency, and hesitancy) and obstruction (frequent urination of small amounts, oliguria, or anuria). Observe urine for blood; strain for stones or gravel. Focus history on factors that predispose patient to urinary tract stones or that may have precipitated current episode of renal or ureteral colic. Assess patient’s knowledge about renal stones and measures to prevent recurrence. Major goals may include relief of pain and discomfort, prevention of recurrence of renal stones, and absence of complications. Administer opioid analgesics (IV or intramuscular) with IV NSAID as prescribed. Encourage and assist patient to assume a position of comfort. Assist patient to ambulate to obtain some pain relief. Monitor pain closely and report promptly increases in severity. Encourage increased ﬂuid intake and ambulation. Begin IV ﬂuids if patient cannot take adequate oral ﬂuids. Monitor total urine output and patterns of voiding. Encourage ambulation as a means of moving the stone through the urinary tract. Crush any blood clots passed in urine, and inspect sides of urinal and bedpan for clinging stones. Instruct patient to report decreased urine volume, bloody or cloudy urine, fever, and pain. Instruct patient to report any increase in pain. Monitor vital signs for early indications of infection; infections should be treated with the appropriate antibiotic agent before efforts are made to dissolve the stone. Explain causes of kidney stones and ways to prevent recurrence. Encourage patient to follow a regimen to avoid further stone formation, including maintaining a high ﬂuid intake. Encourage patient to drink enough to excrete 3,000 to 4,000 mL of urine every 24 hours. Recommend that patient have urine cultures every 1 to 2 months the ﬁrst year and periodically thereafter. Recommend that recurrent urinary infection be treated vigorously. Encourage increased mobility whenever possible; discourage excessive ingestion of vitamins (especially vitamin D) and minerals. If patient had surgery, instruct about the signs and symptoms of complications that need to be reported to the physician; emphasize the importance of followup to assess kidney function and to ensure the eradication or removal of all kidney stones to the patient and family. If patient had ESWL, encourage patient to increase ﬂuid intake to assist in the passage of stone fragments; inform the patient to expect hematuria and possibly a bruise on the treated side of the back; instruct patient to check his or her temperature daily and notify the physician if the temperature is greater than 38.C (about 101.F), or the pain is unrelieved by the prescribed medication. Provide instructions for any necessary home care and followup. Instruct patient to increase ﬂuid intake to assist passage of stone fragments (may take 6 weeks to several months after procedure). Instruct patient about signs and symptoms of complications: fever, decreasing urinary output, and pain. Inform patient that hematuria is anticipated but should subside in 24 hours. Give appropriate dietary instructions based on composition of stones. Encourage regimen to avoid further stone formation; advise patient to adhere to prescribed diet. Teach patient to take sufficient fluids in the evening to prevent urine from becoming too concentrated at night. Closely monitor the patient to ensure that treatment has been effective and that no complications have developed. Assess the patient’s understanding of ESWL and possible complications; assess the patient’s understanding of factors that increase the risk of recurrence of renal calculi and strategies to reduce those risks. Assess the patient’s ability to monitor urinary pH and interpret the results during followup visits. Ensure that the patient understands the signs and symptoms of stone formation, obstruction, and infection and the importance of reporting these signs promptly. If medications are prescribed for the prevention of stone formation, explain their actions, importance, and side effects to the patient. Report pain is relieved with spasms controlled. Document location, duration, intensity (0–10 scale), and radiation. Note nonverbal signs, e.g., elevated BP and pulse, restlessness, moaning, thrashing about. Rationale: Helps evaluate site of obstruction and progress of calculi movement. Flank pain suggests that stones are in the kidney area, upper ureter. Flank pain radiates to back, abdomen, groin, genitalia because of proximity of nerve plexus and blood vessels supplying other areas. Sudden, severe pain may precipitate apprehension, restlessness, severe anxiety. Explain cause of pain and importance of notifying caregivers of changes in pain occurrence/characteristics. Rationale: Provides opportunity for timely administration of analgesia (helpful in enhancing patient’s coping ability and may reduce anxiety) and alerts caregivers to possibility of passing of stone/developing complications. Sudden cessation of pain usually indicates stone passage. Provide comfort measures, e.g., back rub, restful environment. Rationale: Promotes relaxation, reduces muscle tension, and enhances coping. Assist with/encourage use of focused breathing, guided imagery, diversional activities. Rationale: Redirects attention and aids in muscle relaxation. Encourage/assist with frequent ambulation as indicated and increased fluid intake of at least 3–4 L/day within cardiac tolerance. Rationale: Renal colic can be worse in the supine position. Vigorous hydration promotes passing of stone, prevents urinary stasis, and aids in prevention of further stone formation. Note reports of increased/persistent abdominal pain. Rationale: Complete obstruction of ureter can cause perforation and extravasation of urine into perirenal space. This represents an acute surgical emergency. Rationale: Usually given during acute episode to decrease ureteral colic and promote muscle/mental relaxation. Rationale: Decreasing reflex spasm may decrease colic and pain. Apply warm compresses to back. Rationale: Relieves muscle tension and may reduce reflex spasms. Maintain patency of catheters when used. Rationale: Prevents urinary stasis/retention, reduces risk of increased renal pressure and infection. Void in normal amounts and usual pattern. Experience no signs of obstruction. Monitor I&O and characteristics of urine. Rationale: Provides information about kidney function and presence of complications, e.g., infection and hemorrhage. Bleeding may indicate increased obstruction or irritation of ureter. Note: Hemorrhage due to ureteral ulceration is rare. Determine patient’s normal voiding pattern and note variations. Rationale: Calculi may cause nerve excitability, which causes sensations of urgent need to void. Usually frequency and urgency increase as calculus nears ureterovesical junction. Rationale: Increased hydration flushes bacteria, blood, and debris and may facilitate stone passage. Rationale: Retrieval of calculi allows identification of type of stone and influences choice of therapy. Investigate reports of bladder fullness; palpate for suprapubic distension. Note decreased urine output, presence of periorbital/dependent edema. Rationale: Urinary retention may develop, causing tissue distension (bladder/kidney), and potentiates risk of infection, renal failure. Observe for changes in mental status, behavior, or level of consciousness. Rationale: Accumulation of uremic wastes and electrolyte imbalances can be toxic to the CNS. Monitor laboratory studies, e.g., electrolytes, BUN, Cr. Rationale: Elevated BUN, Cr, and certain electrolytes indicate presence/degree of kidney dysfunction. Obtain urine for culture and sensitivities. Rationale: Determines presence of UTI, which may be causing/complicating symptoms. Rationale: Increases urine pH (alkalinity) to reduce formation of acid stones. Antigout agents such as allopurinol (Zyloprim) also lower uric acid production and potential of stone formation. Rationale: May be used to prevent urinary stasis and decrease calcium stone formation if not caused by underlying disease process such as primary hyperthyroidism or vitamin D abnormalities. Rationale: Reduces phosphate stone formation. Rationale: Presence of UTI/alkaline urine potentiates stone formation. Rationale: Replaces losses incurred during bicarbonate wasting and/or alkalinization of urine; may reduce/prevent formation of some calculi. Rationale: Acidifies urine to prevent recurrence of alkaline stone formation. Maintain adequate fluid balance as evidenced by vital signs and weight within patient’s normal range, palpable peripheral pulses, moist mucous membranes, good skin turgor. Rationale: Comparing actual and anticipated output may aid in evaluating presence/degree of renal stasis/impairment.Note: Impaired kidney functioning and decreased urinary output can result in higher circulating volumes with signs/symptoms of HF. Document incidence and note characteristics and frequency of vomiting and diarrhea, as well as accompanying or precipitating events. Rationale: Nausea/vomiting and diarrhea are commonly associated with renal colic because celiac ganglion serves both kidneys and stomach. Documentation may help rule out other abdominal occurrences as a cause for pain or pinpoint calculi. Increase fluid intake to 3–4 L/day within cardiac tolerance. Rationale: Maintains fluid balance for homeostasis and “washing” action that may flush the stone(s) out. Dehydration and electrolyte imbalance may occur secondary to excessive fluid loss (vomiting and diarrhea). Monitor vital signs. Evaluate pulses, capillary refill, skin turgor, and mucous membranes. Rationale: Indicators of hydration/circulating volume and need for intervention. Note: Decreased GFR stimulates production of renin, which acts to raise BP in an effort to increase renal blood flow. Rationale: Rapid weight gain may be related to water retention. Rationale: Assesses hydration and effectiveness of/need for interventions. Rationale: Maintains circulating volume (if oral intake is insufficient), promoting renal function. Provide appropriate diet, clear liquids, bland foods as tolerated. Rationale: Easily digested foods decrease GI activity/irritation and help maintain fluid and nutritional balance. Administer medications as indicated: antiemetics, e.g., prochlorperazine (Compazine). Nursing Diagnosis: Knowledge, deficient [Learning Need] regarding condition, prognosis, treatment, self-care, and discharge needs. Correlate symptoms with causative factors. Review disease process and future expectations. Stress importance of increased fluid intake, e.g., 3–4L/day or as much as 6–8 L/day. Encourage patient to notice dry mouth and excessive diuresis/diaphoresis and to increase fluid intake whether or not feeling thirsty. Rationale: Flushes renal system, decreasing opportunity for urinary stasis and stone formation. Increased fluid losses/dehydration require additional intake beyond usual daily needs. Rationale: Diet depends on the type of stone. Understanding reason for restrictions provides opportunity for patient to make informed choices, increases cooperation with regimen, and may prevent recurrence. Rationale: Decreases oral intake of uric acid precursors. Rationale: Reduces risk of calcium stone formation. Note:Research suggests that restricting dietary calcium is not helpful in reducing calcium-stone formation, and researchers, although not advocating high-calcium diets, are urging that calcium limitation be reexamined. Low-oxalate diet, e.g., restrict chocolate, caffeine-containing beverages, beets, spinach. Rationale: Reduces calcium oxalate stone formation. Short regimen: low-calcium/phosphorus diet with aluminum carbonate gel 30–40 mL, 30 min pc/hs. Rationale: Prevents phosphatic calculi by forming an insoluble precipitate in the GI tract, reducing the load to the kidney nephron. Also effective against other forms of calcium calculi. Note: May cause constipation. Discuss medication regimen; avoidance of OTC drugs, and reading all product/food ingredient labels. Rationale: Drugs will be given to acidify or alkalize urine, depending on underlying cause of stone formation. Ingestion of products containing individually contraindicated ingredients (e.g., calcium, phosphorus) potentiates recurrence of stones. Rationale: Inactivity contributes to stone formation through calcium shifts and urinary stasis. Active-listen concerns about therapeutic regimen/lifestyle changes. Rationale: Helps patient work through feelings and gain a sense of control over what is happening. Identify signs/symptoms requiring medical evaluation, e.g., recurrent pain, hematuria, oliguria. Rationale: With increased probability of recurrence of stones, prompt interventions may prevent serious complications. Demonstrate proper care of incisions/catheters if present. Rationale: Promotes competent self-care and independence.